This is the second novel of the author’s and once again we’re with Detective Inspector Jake Flannagan of the Met’s Counter Terrorism Command. The author, David Videcette, is himself a former police officer who spent much of his career in anti-terror; as with his first novel, The Theseus Paradox, The Detriment sticks very closely to real life. There are quite a few former police officers writing crime fiction and thrillers these days, but where David has carved out a niche for himself is through fictionalising real-life past investigations, cases he came across while working on the Counter Terror Command. Whereas David’s first novel tackled the 7/7 bombings, The Detriment deals with the attempted bombing of the Tiger Tiger nightclub in London and the Glasgow Airport bombing, both of which occurred in the space of a short time in 2007. David’s first novel, The Theseus Protocol, was a brilliant thriller. Apart from being well-written, it had at its core one of the most traumatic events of recent British history, the horrific bombings of 7th July 2005. This gave the book a compelling narrative drive that pulled the reader in. Due to this, when I began reading The Detriment, I was a little concerned to find the focus on a relatively minor event (I accept of course that these bombings were only “minor” in the sense that they were botched and injuries were minimal). I couldn’t help but wonder whether the author was suffering from the well-known writing dilemma of “second book syndrome”. This is when an author achieves such success with their first novel, that expectations for their second are impossible to match, and through no fault of their own they fail to deliver. I needn’t have worried, for The Detriment soon delivers the goods. In fact, I would argue that The Detriment is a stronger novel than the author’s first. This I think, ironically enough, is due to the factor I identify above and which had me concerned in the first place. The 7/7 bombings were such a major event that the author’s first novel naturally enough focused in its entirety on the event. The Detriment on the other hand, through dealing with a comparatively less serious event (once again, if the bombings had been successful, they might have equalled 7/7) allows the author to have his protagonist branch out and explore a whole plethora of issues. The Detriment quickly proves to be a labyrinthine conspiracy thriller, with Jake having to deal with Islamic Fundamentalism, Britain’s relationship with Saudi Arabia, the international arms trade and espionage. If this all sounds confusing, it’s not, rather the book is incredibly well-plotted and at no point does the author get lost in the intricacies of it all. As with any author who writes so closely from what they know, there are lots of minor aspects to the novel that ring with authenticity and are incredibly illuminating. One such aspect I most enjoyed with The Detriment was relationship between the Met’s Counter Terror Command and the UK’s intelligence agencies – the Security Service (MI5) and the Secret Intelligence Service (SIS, better known as MI6). The relationship, the author shows, is characterised by so-called Chinese Walls. Information is not shared freely, instead Jake must book an appointment, ask specific questions (the intelligence officers only answering what they are actually asked and nothing more), basically, he has to almost beg for the relevant information. One might ask why the lessons from 9/11 haven’t been learnt (the official 9/11 commission report identified the lack of communication between the CIA, the FBI, and other US agencies as a major factor for failing to prevent the attacks) and Jake’s frustration at this state of affairs is vividly portrayed by the author. The best aspect of The Detriment however is a more broader affair. As a former current affairs journalist who worked across a plethora of programmes (Channel 4’s Dispatches, various BBC programmes) I’m used to coming across conspiracy theories. Every other day someone would contact our offices with some outlandish theory as to who or what was behind some event of global import. Most of these people were obviously loons – anti-Semites who laid everything at the door of the Jews, the tinfoil hat brigade who believed aliens or shape-shifting lizards stalked the corridors of power. Some theories however were more plausible. Saudi Arabia really has spent years funding a virulently anti-western strand of Islam; the British Government and British Aerospace (Bae) really were involved in a massive and murky arms deal, the effects of which are still being felt today; foreign powers really do assassinate people in our capital city, as amply demonstrated in the Litvinenko affair. By delving into some of this, the author has the reader reassess recent history, wonder just what is true, question whether one has dismissed things too easily. 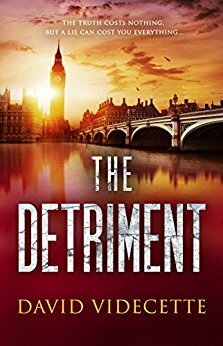 In conclusion, The Detriment is a brilliant conspiracy thriller. It really is an excellent read and I can’t recommend it enough. Loved reading your review, James. It's great to get a perspective from someone who has a real knowledge of these sorts of books and the security services. I'll be nicking some of your quotes to put on a new page on my website with a link to your review, very soon! Thanks for taking the time out to read and review.